This year, learn to listen for the voice of the One who loves you most. We know for sure that God speaks to His people. Throughout the pages of Scripture, He guides, instructs, corrects, inspires, encourages, and reveals. Inspired writers even call Him ?the Word.? He has always been vocal, and He always will be. But what does He say to you? How does He say it? How can you know when you?ve heard Him? Now in a deluxe LeatherLike edition, The One Year Hearing His Voice Devotional, written by acclaimed author Chris Tiegreen, will help you discover patterns and practices you can adopt to hear God better. Listening to God is a process, a journey, and an adventure. He promises that those who seek Him will be rewarded with His presence and His voice. And the words of the living God are powerful and life-changing. The One Year Hearing His Voice Devotional by Tiegreen, Chris was published by Tyndale Momentum in September 2015 and is our 34030th best seller. The ISBN for The One Year Hearing His Voice Devotional is 9781414366869. 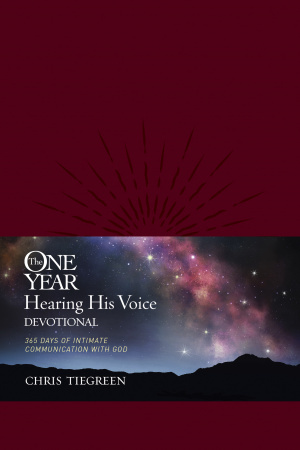 Be the first to review The One Year Hearing His Voice Devotional! Got a question? No problem! Just click here to ask us about The One Year Hearing His Voice Devotional.